Am I the only one seeing these errors in the narrow version? As you can see in the attached picture, there seem to be some issues with the narrow version of the site. The Logo for the forum is next to an empty box. The empty box highlights, the logo doesn't when hovering over it. Same thing with the scale, it doesn't highlight, but it seems to be next to just a wider white space? The logo / button for the Wiki is missing entirely. The icons that don't highlight, are still clickable, though. Since nobody has seem to have mentioned this, I wonder if I'm the only one seeing these errors. I've included Midori, as it is a browser using the Webkit engine, while almost all browsers that used to use Webkit moved on to Blink. I have no access to a modern Microsoft browser like Edge, but in all three aforementioned browsers, the error is basically the same. Although I doubt it, is it down to my settings? The error appears no matter of the theme, whether it's the lite theme or the regular theme, it's the same sort of error, just with slightly different colors. Re: Am I the only one seeing these errors in the narrow version? But IMO worse problems are the very limited portal that can't show topic starter or number of posts. Keeping track of new posts requires either memorizing the timestamps for last activity or just rechecking the same topics and posts over and over. And front page proudly shows "Time Format" instead of a proper timestamp for all posts under the news. The portal settings are hard coded, and obviously, the developer had no idea what he was doing there, because I find myself using the "New Posts" button at the top of the forum to read all topics that have been updated. As for the Time Format, that's up to your profile settings, which allow you to change the formatting of all forum timestamps to whatever you want. That literal "Time Format" string is shown for anyone who isn't logged in. Hmm, OK. Well, if that's not an important issue, I guess you can disregard my inquiry, then. I set up a fresh copy of ElkArte 1.1.1 and cloned that theme repository to my testing server. Without access to the HA web server it is impossible to know what is going wrong. I have mentioned the problems is the other thread with no response from the admins. You don't need access to the live system. Having a development environment that is exactly equal to the live system would be already enough ;-). The problematic buttons are configured through the Ultimate Menu addon. Naturally, if you add your own menu buttons, they will have different hashes than the ones I added to our forum. 2. There is an "a" element in it. In that a element, there is a "i" element. 3. That i elements contains a bad unicode character in the class name. Remove that and add the classname "i-home" instead (needs to be changed once more later). If you can do that in the backend, avoid hard-coding it. 4. Shrink the window and see that it is behaving good now. And that both, desktop and mobile layout, have good looking forum button. 1. 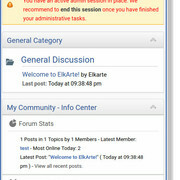 Remove this ruleset completely: "#button_forum .linklevel1::before". But attention, it is very likely that it exists multiple times inside media queries. Be sure to remove all of them. This ruleset is, where the developer of the original theme actually didn't understand the system and which disturbs the system, because he tried to recreate the entire button in that on the wrong HTML element. 2. Find the ruleset "i-home" and duplicate it to "i-forumlink" (ensure before, that i-forumlink isn't given already). 4. Replace "i-home" in the HTML to "i-forumlink". 5. Reload and check if the problem is gone now. Repeat all these steps with the ballance-button. That button has basically the same issue, but it doesn't look that bad because it is the last button. Then the menu bar should behave correct and nice now. Well, it would be nice if things would be more polished, but I can manage using it as it is. I'd like other things like Markdown and LaTeX rendering, but if you can't do that - well, it's just not gonna happen. I thought the thing with the buttons was just an oversight, that I thought I'd point out. Everything should be fixed. My comment was just about prioritizing what to fix first. Narrow view is only visible for mobile users and mobile usability was broken when the mobile version was introduced. True. Hitting microscopic click targets with your finger on a desktop web page is way better. Can you delete and recreate the forum button from the Ultimate menu, so it creates a new hash. Which forum button? The foobar2000 forum? The HA forum button that is displaying the extra box in mobile view. It is labeled "button_forum" which seems odd to me. It should have the label "button_hash#" like the other ultimate buttons do. It's not an ultimate button. It's a SimplePortal button, replacing the Community button, whose action it overrides with the portal. Can you locate the code and replace the icon's classname with a valid one? Oh, I can see you guys have added a couple Icons. They are clickable in both versions, the narrow and the regular width. I guess that works for now? In case you *ever* decide to port this forum to another forum engine, check out NodeBB. I've ported one forum from phpBB to Woltlab Burning board once, it was horrible, and I'd never do it again. But should you ever want to do it, NodeBB, it's my favorite forum software right now. What should I change it to, i-forum? Regarding NodeBB, I think I tried migration of our data to that, and it absolutely choked on the sheer amount of data present in our database. Yes , i-forum will be fine. I will create a separate entry in icons_svg,css for i-forum since it shares the same icon with i-home. I took a look at nodeBB powered forums yesterday. It's a perfect example how modern web tech is nothing but nonsense. Browsing the forums is slow but they added a progress bar so users can see that things are still running. Mobile versions seem to have so huge text and spacing that almost no content fits on the screen. Main point seemed to be that a lot of white around everything is modern and good.